Home » 2013 » CAN A COMMUNIST EXPLAIN? A part of my life (1975 -1984) was wasted as a communist atheist. I was in Delhi or in MP. Throughout the day we would condemn God. When ever we would refer to a believer friend we would say, ‘the ghost of God is yet to be expelled from him.’ Whenever a larger group would arrive from Punjab we would seek free kitchen (langar) of Gurdwara Sis Ganj or Bangla Sahib. 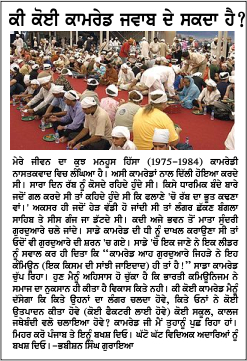 Often comrades would go to Mata Sundri Gurdwara from Ajay Bhawan. When the daughter of our leader was to be admitted in a college we again sought an institute run by a gurdwara. Once a colleague asked the leader, “Comrade is the gurdwara not a kind of commune when the ownership is common?” Comrade could not give a satisfactory reply. But today I have an answer. Indian communist has only caused destruction. I am yet to come across any example of development for society. I am yet to see any langar run by communists. Can any comrade tell us if the party has raised any educational institution, a factory for production? No comrade you can’t quote. Comrades contribution is towards destruction. Oh my comrade brother let us now spare Punjab. Let us spare its educational institutions at least. Industry you have already finished. It is enough now..please..